First, you must ask yourself this: Does your old ceiling contain asbestos? If your construction was complete in the early 80’s or sooner, there is a good chance that the answer is YES. One of the popular uses of asbestos was popcorn ceiling paint. It’s fibers were a cheap and effective aggregate for this widely popular construction product. When asbestos is present, the process of removing popcorn ceiling becomes quite dangerous, disruptive, messy, and expensive for the business or homeowner. Asbestos is a well known toxin. Asbestos is a major cause of Malignant Mesothelioma, a rare cancer caused by inhaling or swallowing airborne asbestos fibers which destroy protective tissues that cover the lungs and abdomen. For decades industries have known about the dangers of asbestos and continued to produce harmful products, successfully dodging regulations to curb asbestos production. The evidence of asbestos related health issues became so overwhelming that the government was forced to take action and put a ban on asbestos production in 1973. Manufacturers were given several years to phase out asbestos and replace it with other materials in all asbestos-containing products. Even after the manufacturing ban, there were a lot of products on the market from the previous years and the suppliers were allowed to continue to sell off asbestos-containing products until their stocks ran out in the early 80’s. Unfortunately, by that time that asbestos was already part of millions of buildings and the damage was done. The National Institute of Health (NIH) estimates that 11 million people received dangerous asbestos exposure between 1940 and 1978. It’s imperative to protect yourself, your family, your workers and your investment by evaluating your potential risk of asbestos exposure before implementing any renovation projects in your home or office space. Asbestos is a naturally occuring mineral which is harmful when inhaled. This means it is NOT harmful until it is released into the atmosphere. Asbestos is only dangerous when it is disturbed by scraping or sanding, which disrupts the dormant mineral fibers and releases them into the air. Once sanded or scraped, asbestos mineral fibers remain in the air until the air is purified by special equipment, capable of filtering out the dangerous toxins. This makes asbestos mitigation classifiable as a HazMat activity; a heavily regulated and monitored activity and thus very expensive to carry out. Air must be tested several times by independent labs to make sure that occupants of a building are not exposed to dangerous levels of asbestos. There is a healthier and more economical way to deal with asbestos containing textured ceilings. The solution we offer is simple: leave asbestos alone and do not disturb it. Even without asbestos, popcorn ceiling removal in itself is incredibly messy and can be dangerous for people with allergies or sensitivities to dust and odor. If you want level, smooth ceilings without the hassle and expense of scraping and removing old popcorn paint, we suggest encapsulating it with stretch fabric ceilings. To encapsulate a popcorn ceiling is to enclose it with a fire rated architectural membrane without disturbing the surface of the ceiling containing asbestos. A perimeter track has to be mounted to the walls to avoid penetrations and drilling into the ceiling. Then, stretch ceiling fabric is tucked into the track creating a perfect surface. The ceiling membrane is stretched over the popcorn paint, creating a 1” air space between old the popcorn thereby enclosing it within a capsule. Don’t overpay for Asbestos remediation and removal. 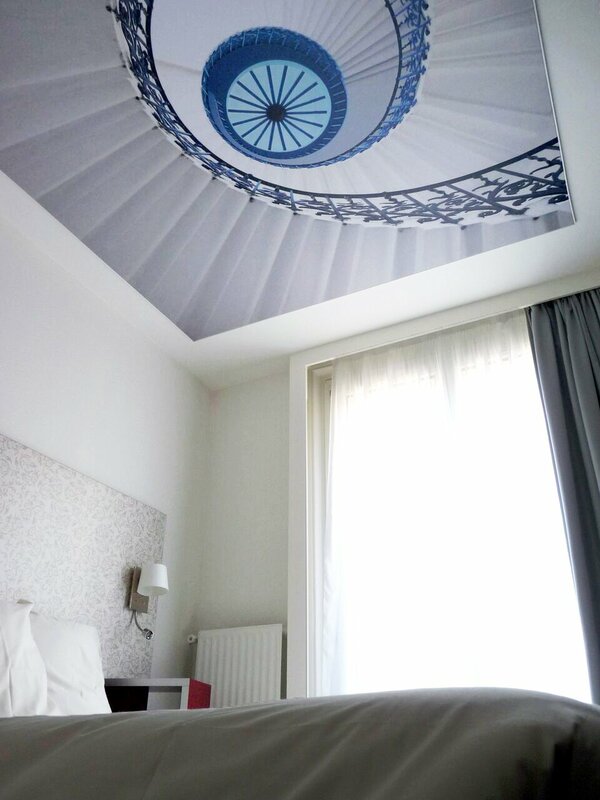 Encapsulate your old ceiling with the newest technology. Let us help you take care of yourself, your family, and your friends by offering a safe alternative to popcorn ceiling removal.We offer you stretch fabric ceilings made from the highest quality materials and the leading brand in the industry. If you decide to remove and replace your ceilings, you will have to spend money, unnecessarily, on asbestos remediation and removal. This is a burden that you can easily avoid by installing stretch fabric ceiling. The innovative technology offered by Popcorn Ceiling Solution enables you to encapsulate your old ceiling with the newest solutions on the market. Knowing the dangers of asbestos removal and abatement, Popcorn Ceiling Solution is proud to offer you and your family not only a safe alternative but an affordable, seamless classic ceiling. Click here to learn more about Stretch Fabric Ceilings.